Great curb appeal and old charm in this cute country home. 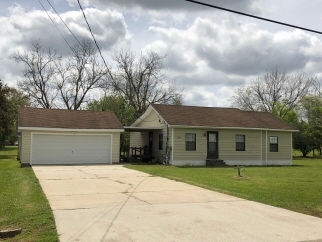 Features include 3 bedrooms and 2 baths, vinyl flooring, carpeting, dining nook, breakfast bar in den combo area with attractive knotty pine walls, broom closet plus pantry. Inside utility, central air and heat, all appliances stay. Hardwood floors under most areas. Side patio cover attaches to detached garage. Large storage/old garage may be used but needs some work. Total land is .85 acre and very well maintained.